There’s a saying that ‘everyone has a book inside them’ – this debut album by John Holden may similarly suggest that perhaps we may all have an album inside us. After years of ‘normal life’ John Holden just decided he would make an album and achieve a life long dream. Simple as that – but undoubtedly, a whole lot easier said than done. 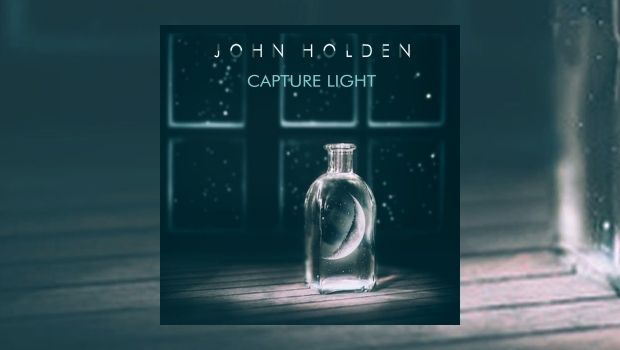 On the evidence of Capture Light Holden clearly has talent as a multi-instrumentalist and songwriter, but what is particularly remarkable is that a complete unknown somehow managed to put together such an impressive and assured album first time out. That’s really not how it should work! Similarly, it also seems remarkable that Holden somehow persuaded an eminent set of notable musicians, whom have played with well-known artists including Yes, The Enid, Steve Hackett, Strawbs, Mystery and Tiger Moth Tales, to collaborate with him on his album. This is a testament in itself to the quality of this release. As charming and persuasive as John Holden may be as a person it is hard to imagine such an array of artists lending their talents to a project if they did not recognise that this was a serious musician with quality material worthy of their involvement, even if he was an unknown artist. Such an approach also shows sound judgement and modesty that as a musician Holden identified that despite his own best efforts there were some elements of his songs that would be greatly enhanced by working with high calibre artists. Putting aside his own ego, it seems clear for Holden that the quality of his music is paramount, and this pays off very successfully on this album. It’s a flowing, melodic and diverse listen, encompassing straightforward hook filled rock such as Crimson Sky, the world music rhythms of Dreamcatching, the gentle acoustic sentiment of Seaglass Heart, the jazz inflections of No Man’s Land, the theatrical drama of the West End musical-like One Race, and most impressively the ornate progressive rock of Tears from the Sun. The gallery of singers Holden has assembled gives each piece a distinctive character with songs suited for their voices. Julie Gater’s sweet voice echoes Annie Haslam of Renaissance on Crimson Sky, which features a fine guitar solo from Billy Sherwood of Yes. Actually it was probably Billy Sherwood’s involvement which helped John Holden recruit such a roster of talent. Holden approached him to do some mixing of his music, but this somehow morphed into Sherwood playing bass on Dreamcatching and volunteering the guitar solo for Crimson Sky. Having Sherwood agree to work with him helped open the door for other artists as Billy’s name convinced other artists to also get involved. As impressive and eye catching as some of the guest artists are on this album it would be a dis-service to John Holden to assume that the musical quality is mainly down to the guests. He played at least 75% of the music, and his musical skills are most impressively demonstrated on the dramatic One Race, which was virtually all played by Holden, accompanied to great effect by Joe Payne (yes ‘THAT Joe Payne’, formerly of The Enid) on vocals. The path to achieving this album was not easy at all for John. Apparently 2 or 3 years ago he approached Rob Aubrey, the renowned producer long associated with the great Progressive rock band IQ and more recently Big Big Train, with some early demos. Holden has shared that Aubrey was brutally honest in his feedback: “To be blunt he ripped it to pieces! Bad timing, tuning issues, poor production… the end was listless!” Nevertheless, Holden rather than being downhearted took such criticism seriously and realised that if he wanted to achieve his dream he was going to have to significantly ‘up his game’. Over two years later it is clear that John Holden certainly took those lessons on board as he has released an album of remarkable quality, skill, imagination and assurance… and reportedly it has also now received the Rob Aubrey sonic seal of approval, which was clearly satisfying for Holden, and to Aubrey’s credit shows the value of honest feedback. The variety of musical styles used on this album is matched by a fascinating range of subjects and inspirations for the lyrics, including stories about the Spanish Conquistadors in the New World, the 1930’s athlete Jesse Owens, the 16th Century Italian Renaissance artists, and more poetic pieces on the positive effects of ‘green therapy’ and Native American Dreamcatchers. This is an album to engage the mind with interesting stories and to touch the heart with more emotional pieces. Seaglass Hearts features a touching duet between Julie Gater and Peter Jones of Tiger Moth Tales, singing about the mending of broken hearts through the healing of time, allowing us to love once more. In all honesty, for me that emotion is in danger of tipping over into rather saccharine sentimentality in this song, but for others it may just feel enchanting – it’s a fine line sometimes. Some songs will appeal more than others – the meandering No Man’s Land was less engaging in my view, but others may like the jazzier sections. Any such reservations are minor when put in to the context of the all–round high quality of this album. Holden’s sense of spirituality and optimism in the face of life’s trials is expressed on the Ancient of Days, featuring the emotive vocals of Jean Pageau of the outstanding Canadian band Mystery. His vocals are skilfully interweaved with additional voices from Gater, Lee-Anne Beecher and the wonderful tones of Marc Atkinson of Riversea and formerly Nine Stones Close, which gives this song an interesting and attractive vocal palette. It appears safe to say that on this album Holden certainly knew his direction, and takes the listener on a fascinating and enjoyable journey with ‘joyous song’. Some reviewers like to compare albums with other artists as a reference for listeners. 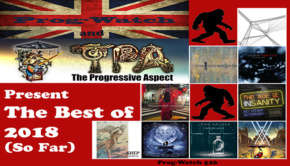 However, one only has to look at the range and pedigree of the artists Holden persuaded to collaborate with him to realise the sorts of musical influences that permeate this album – there are definite echoes of Yes, Big Big Train, Steve Hackett, Mystery and Tiger Moth Tales amongst others, but Holden has also managed to produce an album with it’s own distinctive flavour and ‘feel’. This remarkable debut album is definitely worth exploring and it’s origins are also rather inspiring. Of course not everyone has an album inside them as they lack the musical ability so evident in John Holden, but maybe we should all consider what may be locked inside us that could be expressed in some way… maybe it’s time to pick up the pen and just start writing that book myself!